Model: Current-conducting connections can be installed of all of the cars, either the 7319 coupling or 72020/72021 close couplers that can be uncoupled. The cab control car has a detailed buffer beam and separately applied end streamlining. It also has a lighted train destination sign. The engineer's cab has interior details. Total length over the buffers 107.7 cm / 42-3/8. 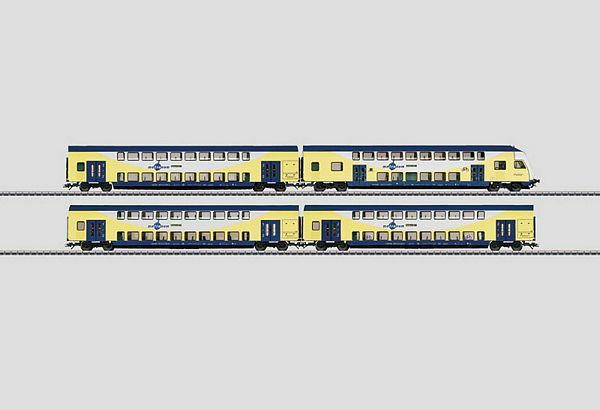 The LNVG Niedersachsen class 146.2 electric locomotive is the right motive power for this car set. It is available under item no. 36612 in the Marklin H0 assortment.